Clive James has been close to death for several years, and he has written about the experience in a series of deeply moving poems. In Sentenced to Life, he was clear-sighted as he faced the end, honest about his regrets. In Injury Time, he wrote about living well in the time remaining, focusing our attention on the joys of family and art, and celebrating the immediate beauty of the world. When The River in the Sky opens, we find James in ill health but high spirits. Although his body traps him at home, his mind is free to roam, and this long poem is animated by his recollection of what life was and never will be again; as it resolves into a flowing stream of vivid images, his memories are emotionally supercharged ‘by the force of their own fading’. In this form, the poet can transmit the felt experience of his exceptional life to the reader. As ever with James, his enthusiasm is contagious; he shares his wide interests with enormous generosity, making brilliant and original connections, sparking passion in the reader so that you can explore the world’s treasures yourself. Because this is not just a reminiscence, it’s a wise and moving preparation for and acceptance of death. As James realizes that he is only one bright spot in a galaxy of stars, he passes the torch to the poets of the future, to his young granddaughter, and to you, his reader. 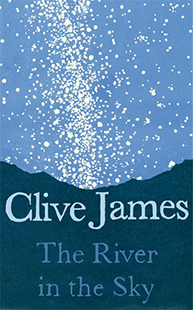 Clive James is the multi-million-copy bestselling author of more than forty books. His poetry collection Sentenced to Life and his translation of Dante’s The Divine Comedy were both Sunday Times top ten bestsellers, and his collections of verse have been shortlisted for many prizes. In 2012 he was appointed CBE (Commander of the Most Excellent Order of the British Empire) and in 2013 an Officer of the Order of Australia. The River in the Sky is published by Picador and available all leading book retailers including Booktopia.